User Selectable for detecting All Metals Mode or Ferrous Metal Only Discrimination Mode! the Mediscan loss Prevention Detector has been developed to lower hospital operating costs. It prevents surgical instruments, tools, sensors and monitoring equipment discarded during surgical suite cleaning from being lost. Expensive re-usable stainless steel implements, often costing hundreds of dollars, are regularly discarded during cleaning. At many hospitals, the replacement costs alone exceed tens-of-thousands of dollars per year. Ranger developed the Mediscan to address this need. It provides a fast, inexpensive method of scanning medical waste bags and is an excellent deterrent against employees who negligently discard equipment. Mediscan is also used to scan laundry for concealed metal objects and to prevent it from getting damaged or destroyed. 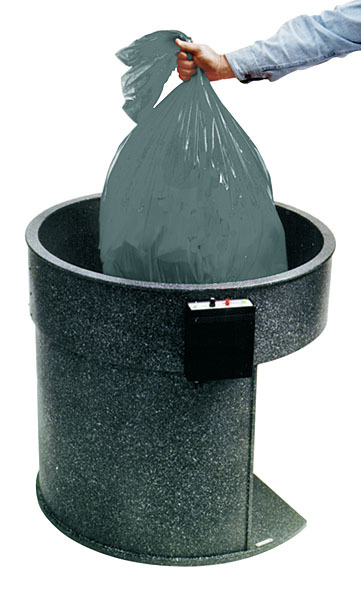 Losses are prevented by simply dropping biohazards trash bags through Mediscan's sensor. Surgical suite laundry is scanned the same way. The screening procedure is fast and easy. Mediscan alarms when a surgical instrument or tool passes through it. A variable sensitivity adjustment and advanced high discrimination microprocessor controlled electronics enable managing to specify the size and type of objects that must be detected. For example, the most commonly used discriminate mode detects stainless steel or ferrous objects only. This allows objects such ads bulldog clips to be targeted while ignoring other metals objects such as aluminum sharps pouches and copper electrode wires, etc. A second control option permits all types of metal to be detected. This operating mode is useful when inspecting laundry. The Contra/MediScan metal detector has been developed to offer a fast, reliable, and inexpensive way to scan laundry, trash bags, and parcels for prohibited or stolen metal items. These items may be screened on entry to prevent the introduction of an illicit metal object or upon exit to prevent the loss/theft of a metal item. The screening procedure is fast and easy. Contra/MediScan alarms when a metal object is passed through it. A variable sensitivity adjustment and advanced high discrimination microprocessor controlled electronics enable the operator to specify the size and type of metal objects that must be detected. Price Requests or Questions ?